Hydrogen has been billed by many as the ‘future fuel’, a key reason being because the only emission from a hydrogen fuel cell car is water. 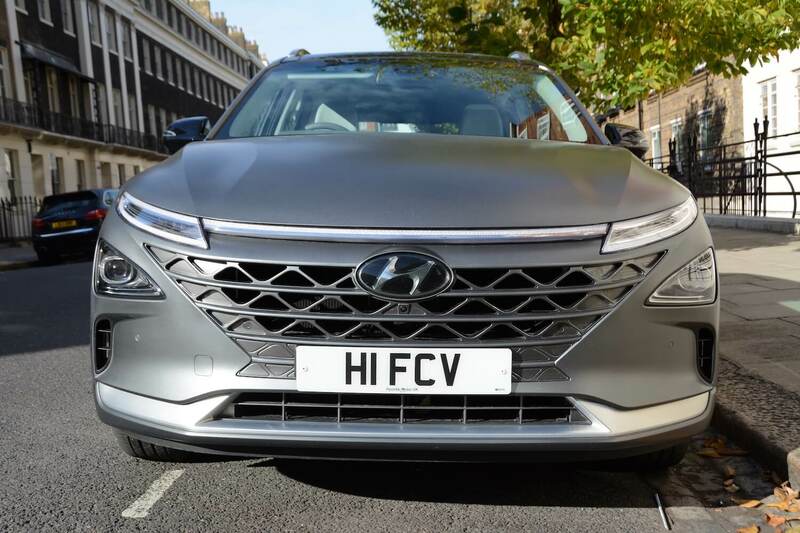 However this future fuel label has been talked about for a number of years and, certainly in the UK, we’re not really much closer to everyone driving around in hydrogen cars. But Hyundai has different ideas. 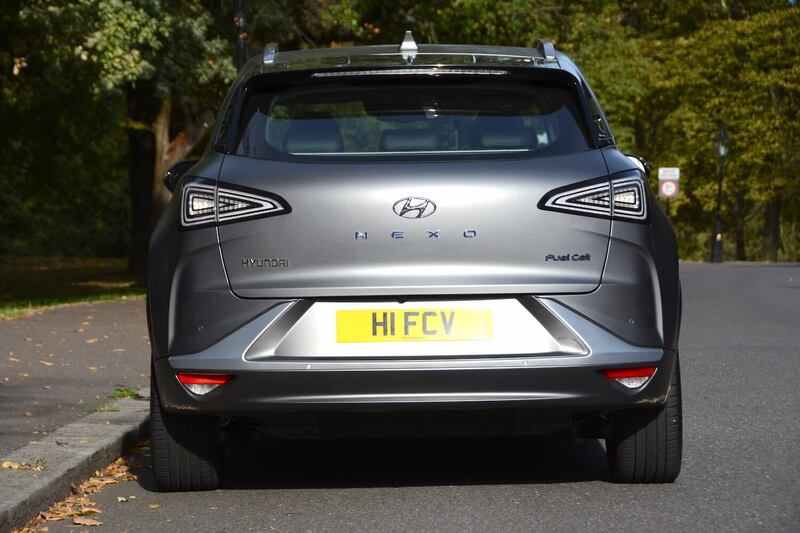 The company has already brought us the ix35 Fuel Cell, and now we have its second-generation fuel cell vehicle, the NEXO – which the firm calls a ‘Future Utility Vehicle’ (an FUV) – and it’s one of the most convincing hydrogen fuel cell cars yet. Unlike the ix35, the NEXO is built on a new, dedicated fuel cell platform. 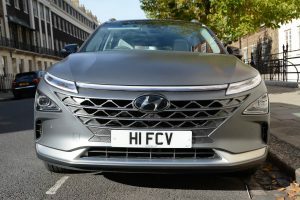 The Hyundai NEXO is a hydrogen fuel cell vehicle, which mean that it’s an electric car – with an electric motor to drive the wheels like other EVs – but the fuel cell generates its own electricity on board from a chemical reaction between hydrogen and air – with water as the only emission. So you can refuel the NEXO in around five minutes, compared to potentially many hours with pure electric cars. The NEXO features the latest fuel cell technology, which is smaller, lighter and stronger – the vehicle kerb weight is 1814 kg, which, although relatively heavy, is actually significantly lighter than many previous hydrogen fuel cell vehicles. It has three hydrogen tanks with a total volume of 156.6 litres. All this technology is in an SUV-like body, so it’s spacious inside. 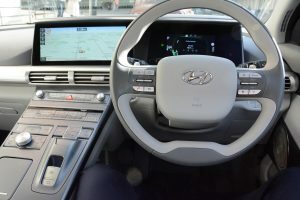 The interior is relatively conventional, with a large central 12.3-inch LCD display for the satnav, as well as a 7-inch LCD instrument cluster. In a world where many cars are gaining minimalistic dashboards, the NEXO still features a lot of buttons. 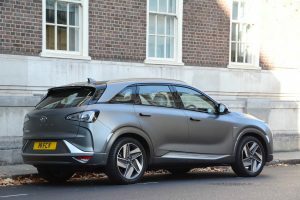 Our drive of the Hyundai NEXO was through the centre of London. So you’ll have to excuse us for not reporting on its ability to race around a track at high speed. In fact high – or even medium – speed wasn’t something that we came close to in London. The NEXO is an automatic, but if it was a manual, we wouldn’t have managed to get beyond second gear for most of the test route. It makes you wonder why anyone would drive in London, and how much longer the current transport system can continue. Anyway, the point is that the NEXO was an oasis of calm in a sea of madness. Despite measures to encourage electric cars, the vast majority of vehicles around us were diesel taxis, diesel buses (some with a degree of electrification), diesel vans, and crazy moped delivery bikes. As we edged forward inch by inch, you couldn’t help feeling sorry for all the drivers with manual transmission, who must have been experiencing a very sore left knee due to coming off and on the clutch continually. And you have to feel sorry for everyone in breathing distance of all the diesel emissions (which would include ourselves). In contrast, the NEXO was extremely refined and glided along silently, with a comfortable ride, and responsive acceleration during the rare few metres when we were actually able to move forward. And not only did it emit zero CO2, particulates or NOx, it was actually cleaning the air as we drove: 99.9 per cent of particulates are purified by the vehicle, and the instrument cluster displays how much air you’re cleaning. The air filter can filter micro-particulates smaller than particulate matter (PM) 2.5 in size. This is obviously a useful feature in London – as well as in most other cities in the UK and globally. Like most other EVs, the NEXO has an adjustable regenerative braking system which allows the driver to adjust the intensity of the regenerative braking by using the paddle shifts behind the steering wheel to recuperate energy. The NEXO has fuel consumption of 0.95 kg of hydrogen per 100 km. This probably doesn’t mean much to most people; the more important figures are that it emits zero g/km CO2 – and zero particulates or NOx – and it has a driving range of 414 miles, according to the new, more realistic WLTP test (or 466 miles based on the NEDC test). And it takes only five minutes to refuel. However you’ll have to find a hydrogen refuelling station to do this. At the last count there were only around 12 operational hydrogen refuelling stations in the UK. So this is somewhat of an issue for the NEXO or for any other hydrogen vehicle in the UK. It is expected that fleets with their own on-site hydrogen supply will be the first to adopt hydrogen vehicles. 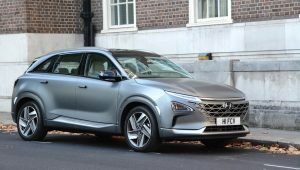 The Hyundai NEXO is now available to buy in Europe at around £65,000. Yes this is expensive, but you are getting future powertrain technology that isn’t yet mass produced to the same level as petrol, diesel or even electric vehicles. Hyundai says that the powertrain should have a life of at least 10 years and 100,000 miles. 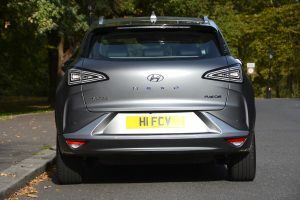 The Hyundai NEXO is without doubt a highly impressive vehicle. It’s extremely smooth and refined to drive, similar to other EVs, but it offers a longer driving range than any current electric car. Not surprisingly, it’s also expensive. So it’s the future then? Probably. But what about the present? Ah, well there’s just the small matter of how you refuel it with hydrogen. For areas in the world where there is a hydrogen refuelling infrastructure (with sustainably-produced hydrogen), then the NEXO is a great solution. In the UK, at the last count, there were only around 12 operational hydrogen refuelling stations. 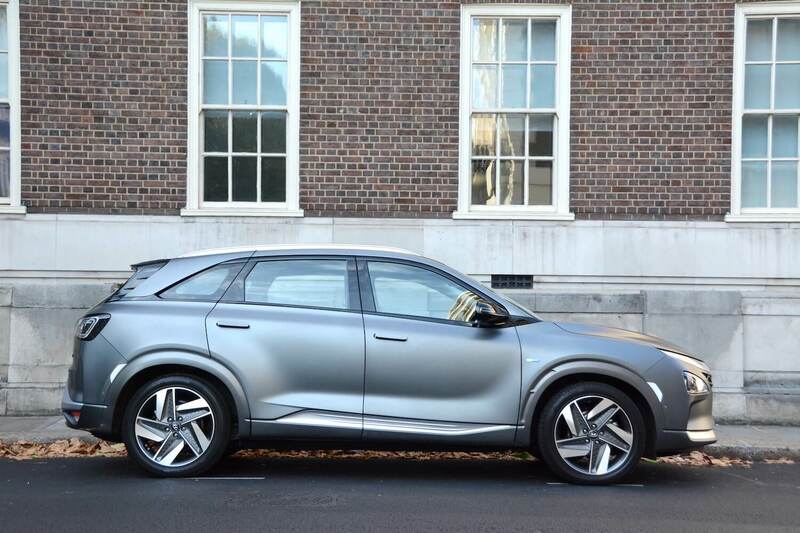 The general consensus in the UK is that we’re struggling with charging infrastructure for electric cars, so asking the government to work with industry to roll out a nationwide hydrogen refuelling network when there are virtually no hydrogen vehicles is a big ask. Despite the fact that most motorists are currently not able to refuel it across most of the UK, although some fleets may have more opportunity to do so, as a ‘technology demonstrator’, the Hyundai NEXO is awarded a Green Car Guide rating of 9 out of 10. 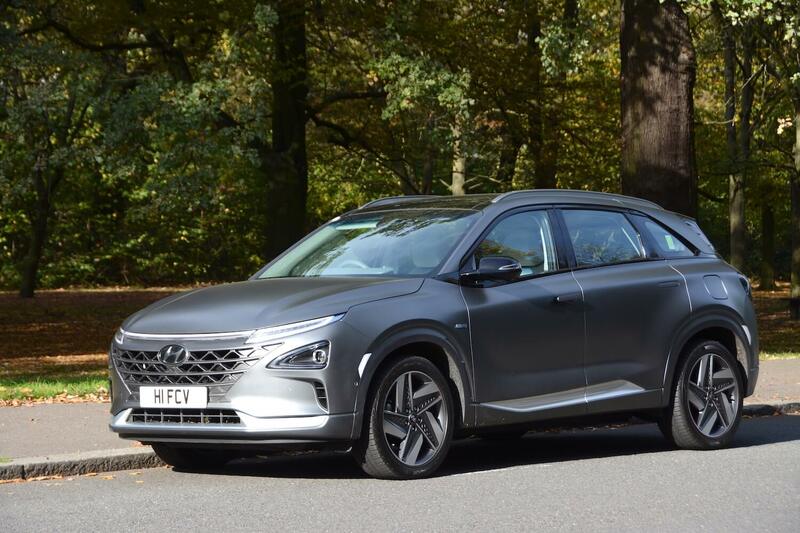 Perhaps a final point to consider is that Hyundai hasn’t been established as a mainstream car brand in the UK for many years, yet it has overtaken most competitors with the fuel cell technology as featured in the NEXO. 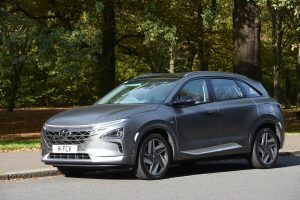 It has also overtaken virtually all competitors with the Hyundai KONA Electric, which offers a 300 mile range for £30,000. And Hyundai is on course to introduce 18 ultra-low emission vehicles globally by 2025. Other manufacturers should be watching Hyundai very closely.